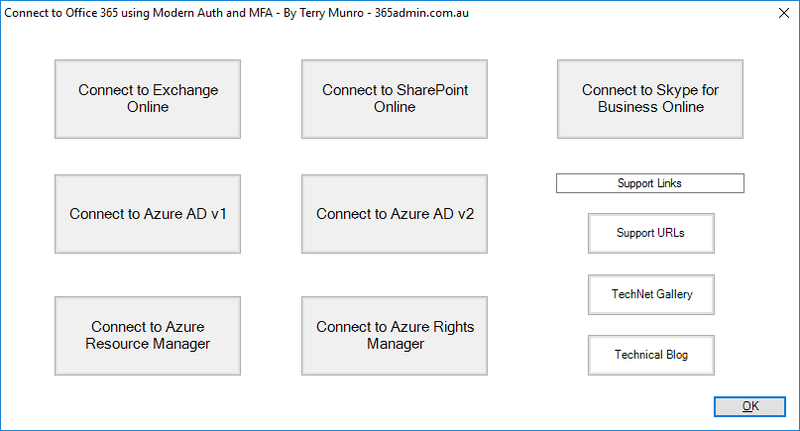 I am proud to announce the release of the updated version of my popular Office 365 Connection Script with Modern Auth - and MFA (Multi-Factor Auth). This new version features a simple GUI to select the service you want to connect to. The script will connect to the following services with Modern Authentication. Due to the nature of Multi-Factor Authentication, credentials cannot be used multiple times like my other connection scripts. 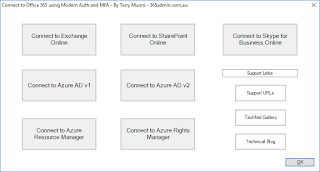 It is for this reason that I have utilised a fully functional GUI where you simply choose the Office 365 service you want to connect to with Modern Authentication. You will be presented with a pop-up credential window. Enter your administrator UPN and password and you will then be connected to that service. You will be presented with a pop-up credential window. Enter your administrator UPN and password. After your credentials are accepted, the Multi-Factor Authentication process will send a text to your mobile / cell phone (depending on your choice of MFA verification). Enter that code and once verified, you will be connected to that Office 365 service. After authentication, you will then be able to run your scripts for the associated Office 365 service. Note - If you need to connect to multiple services, just simply run the script multiple times to connect to the extra services. Please see the resources section below for support. If you need other PowerShell connection scripts that do not support Modern Auth - MFA connections, check out my other connection scripts.